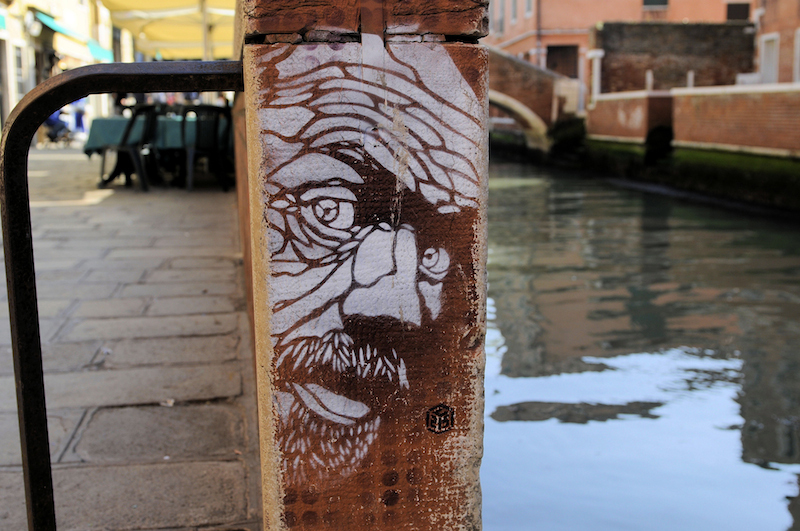 Work by C215 in Venice, Italy. Photo by Son of Groucho. Christian Guémy aka C215 is a French stencil artist who has been working with stencils on the street since the mid-2000’s. I believe his career blossomed largely thanks to combination of a great deal of travel and a healthy appreciation for the internet. As a typical contemporary street artist it’s useful to get his thoughts on what the internet has done for his work and street art in general. Guémy: Street art is nothing else but urban poetry that catches someone’s eye. Being a street artist is impossible, because the city itself is the artist. Street art is a collective thing, participative and interactive, extremely linked to web 2.0 culture. RJ: What do you mean when you say that street art is “extremely linked to 2.0 culture”? Can you expand on that thought? How is it linked? Guémy: Like the streets, the internet is not considered by most as venue for art. It is simultaneously an interactive and participative place, as streets can be. You go into the streets, leave something that you paint, that you sampled from reality through a photograph. It creates a real installation. Then street photographers will pass by and take a picture of your installation and put it immediately onto web, spreading it online. You can then see how your work has been altered by the photographer, putting a new spin on it. Some of them get real artistic pictures that just include a piece of yours. This is the process of street art. RJ: You make it sound as though taking photos and posting them online is nearly as important a part of your artistic process as cutting and spraying the stencils. Is that the case? If so, why? Guémy: This is the only new thing: Painters have been painting since forever, doing murals since antiquity, using spray cans for a long time now. So what is new if not the internet thing? On the internet you are your own gallerist, theoretician, photographer and videomaker. On the internet you can interact with your public without being physically present, as it should be with graffiti. If we are contemporary artists, it is because we use the internet. RJ: Do you think that being in Paris led you to working with stencils? Guémy: Sure! Paris has such a long history with street art and that is mainly through stencils that appeared in the 80′s. Apparently more than 120 stencil artists were already painting in the streets of Paris in the mid-80′s. I feel that I am just one of the numerous french stencil artists, and I am proud to get credit in such a competition. RJ: How do you find source material for your stencils? Guémy: Anywhere on the web if I need a picture for the streets, but for my gallery works, since my works recently became valuable, I pay attention to using pictures of mine or pictures I got the rights to use. RJ: How do you generate publicity for your projects and why do you use the strategy that you do? Guémy: In the streets and on internet, because these places are the most beautiful galleries ever. We are now entering the “hypermediation” culture. No medias anymore, we need nobody and we do art where you not expect it, outside of anyone’s control. The streets and the internet are strongly linked to freedom. RJ: How do most people see your work? Online or in person? If they see it online, how do they come across it? Guémy: Physically for sure, and with no comparison, but in the streets people see mainly one artwork, not a whole body of work or the brand identification that you get on internet, where each artist more or less organizes his own virtual perception, while street works keep it real. It is a balanced story, between art and life, reality and abstraction. RJ: At what point did you realize that the internet was making an impact in street art and graffiti? Guémy: The day my 9 years daughter said to me that she read most of my past interviews using google on her iPod.